Liu, X. and Chen, J. 2017. CO2 seasonal variation and global change: Test global warming from another point of view. Sciences in Cold and Arid Regions 9: 0046-0053, DOI: 103724/SP.J.1226.2017.00046. In this posting we review the work of two Chinese scientists, Liu and Chen (2017), who performed a significant and thorough investigation of the relationship between atmospheric carbon dioxide and temperature, challenging the fundamental argument of the IPCC that rising atmospheric CO2 is causing rising global temperature. For the past year and a half a printout of this article has remained buried under a pile of papers on a desk in our office intended for review and posting on CO2Science. Now, after a long wait (and overdue cleaning of our office), this important work gets the attention it deserves. As their contribution to science, the two scientists thus proceed to present just such a challenge by examining the relationship between temperature and CO2 using data from Mauna Loa, Hawaii and other observing stations across the globe. Their analyses revealed several important findings, which are discussed in detail below, often using direct quotes from the authors’ paper. 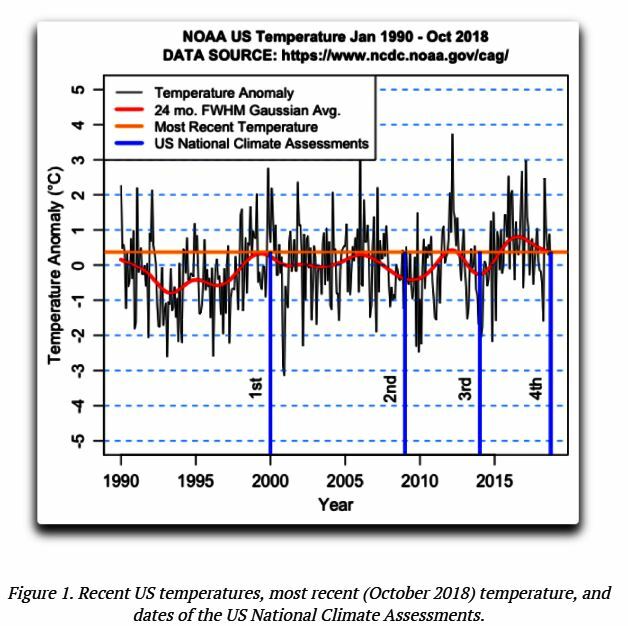 Posted in Climate change and tagged climate, global warming on September 23, 2018 by wryheat2. This post collects several past articles which review the science and bring together some main points on the state of the climate debate. These points show that the politically correct, carbon dioxide driven meme is wrong. Readers can use these articles to counter climate alarmist. Read each article for more details. Climate change is a major issue of our times. Concern is affecting environmental, energy, and economic policy decisions. Many politicians are under the mistaken belief that legislation and regulation can significantly control our climate to forestall any deviation from “normal” and save us from a perceived crisis. This post is intended as a primer for politicians so they can cut through the hype and compare real observational data against the flawed model prognostications. The data show that the current warming is not unusual, but part of a natural cycle; that greenhouse gases, other than water vapor, are not significant drivers of climate; that human emissions of carbon dioxide are insignificant when compared to natural emissions of greenhouse gases; and that many predictions by climate modelers and hyped by the media are simply wrong. I have posed that question to five “climate scientist” professors at the University of Arizona who claim that our carbon dioxide emissions are the principal cause of dangerous global warming. Yet, when asked the question, none could cite any supporting physical evidence. Rather than being a “pollutant.” Carbon dioxide is necessary for life on Earth as we know it. Earth’s climate has been changing for at least four billion years in cycles large and small. Few in the climate debate understand those changes and their causes. Many are fixated on carbon dioxide (CO2), a minor constituent of the atmosphere, but one absolutely necessary for life as we know it. Perhaps this fixation derives from ulterior political motives for controlling the global economy. For others, the true believers, perhaps this fixation derives from ignorance. Scottish physicist James Clerk Maxwell proposed in his 1871 book “Theory of Heat” that the temperature of a planet depends only on gravity, mass of the atmosphere, and heat capacity of the atmosphere. Temperature is independent of atmosphere composition. Greenhouse gases have nothing to do with it. Many publications since, have expounded on Maxwell’s theory and have shown that it applies to all planets in the Solar System. The Grand Canyon of Arizona provides a practical demonstration of this principle. The U.S. government’s National Climate Assessment report and the UN IPCC both claim that human carbon dioxide emissions are “intensifying” the greenhouse effect and causing global warming. 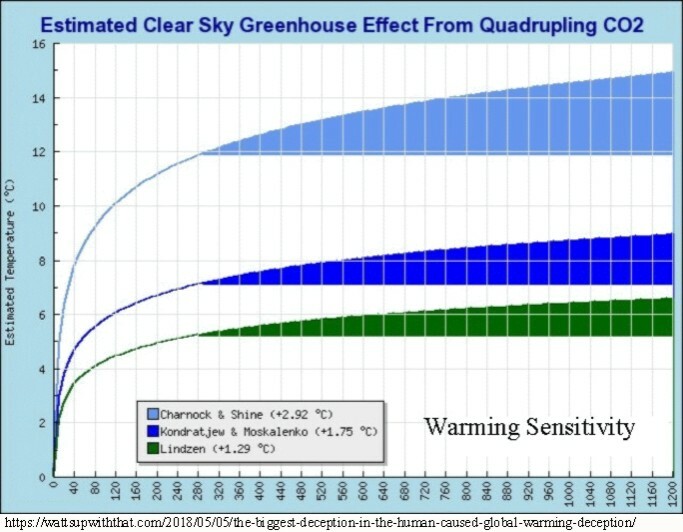 The carbon dioxide driven global warming meme makes four specific predictions. Physical evidence shows that all four of these predictions are wrong. 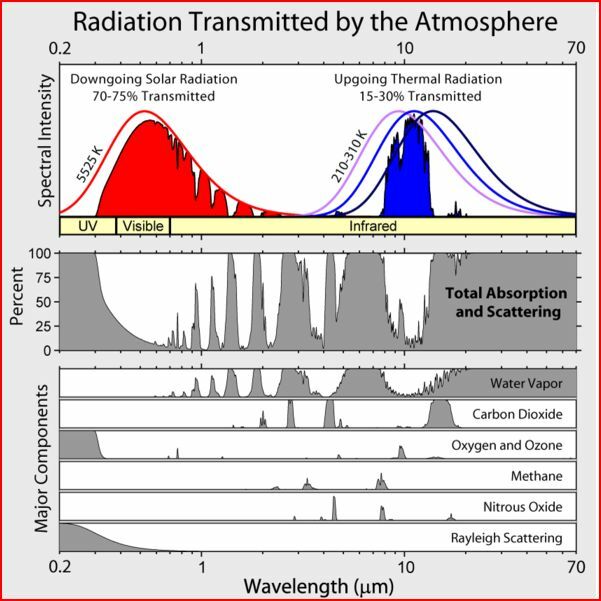 In this article, we will examine the Earth’s temperature and the carbon dioxide (CO2) content of the atmosphere at several time scales to see if there is any relationship. I stipulate that the greenhouse effect does exist. I maintain, however, that the ability of CO2 emissions to cause global warming is tiny and overwhelmed by natural forces. The main effect of our “greenhouse” is to slow cooling. 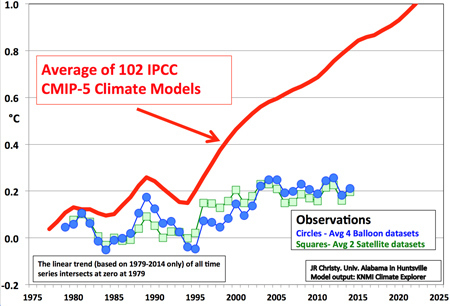 The United Nation’s IPCC and other climate alarmists say all hell will break loose if the global temperature rises more than an additional 2º C (3.6ºF). That number, by the way, is purely arbitrary with no basis in science. 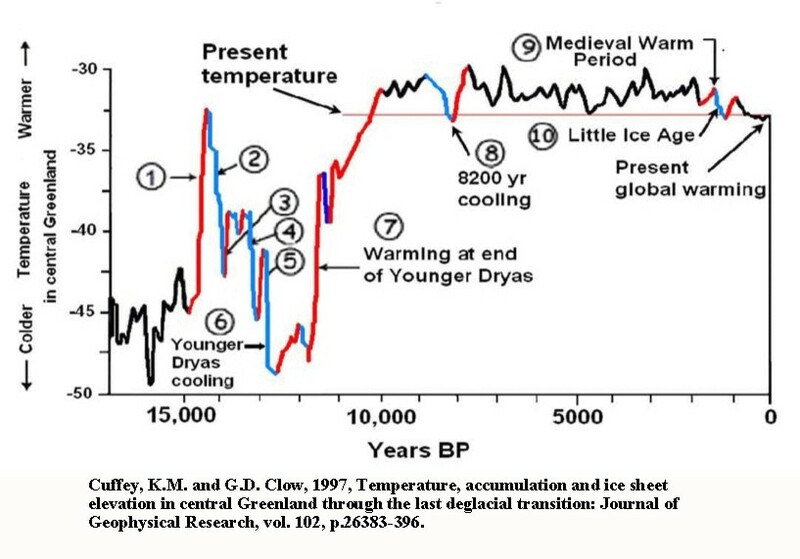 It also ignores Earth’s geologic history which shows that for most of the time global temperatures have been much warmer than now. Let’s look back at a time when global temperatures are estimated to have been as much as 34ºF warmer than they are now. Hell didn’t break loose then. The EPA’s “endangerment finding” classified carbon dioxide as a pollutant and claimed that global warming will have adverse effects on human health. Real research says the opposite: cold is deadlier. The scientific evidence shows that warming is good for health. Melting of the Greenland and West Antarctic ice sheets have been blamed on global warming, but both have a geologic origin. The “Blob” a recent warm ocean area off the Oregon coast, responsible in part for the hot weather and drought in California, has been blamed on global warming, but that too may have a geologic cause. It has been claimed that 97% of climate scientists say humans are causing most of the global warming. An examination of the numbers and how those numbers have been reached show that only 8.2% of scientists polled explicitly endorse carbon dioxide as the principal driver. The basic conclusion of this review is that carbon dioxide has little effect on climate and all attempts to control carbon dioxide will be a futile and expensive exercise to no end. All the dire predictions are based on flawed computer models. Carbon dioxide is a phantom menace. Posted in Climate change and tagged carbon dioxide, Climate change, CO2, global warming on April 28, 2018 by wryheat2. Organic nitrogen compounds such as ammonia (NH3) act as plant fertilizers. Robust plant growth consumes more atmospheric carbon dioxide during the process of photosynthesis. However, atmospheric nitrogen (N2) is relatively inert. It is converted to organic nitrogen compounds by bacteria in the top soil layers. (See nitrogen fixation) Climate models have assumed that the atmosphere is the only source of nitrogen and have therefore underestimated its fertilization effect and also underestimated the capability of plants to remove carbon dioxide from the atmosphere. New studies show that much nitrogen comes from rocks, some already in useable organic form. Weathering of rocks releases this organic nitrogen. Nitrate deposits in arid and semi-arid regions provide another source of nitrogen. A new study, reported by Science Daily, concerns research conducted by University of California – Davis published April 6, 2018. Study citation: B. Z. Houlton, S. L. Morford, R. A. Dahlgren. Convergent evidence for widespread rock nitrogen sources in Earth’s surface environment. Science, 2018; 360 (6384): 58 DOI: 10.1126/science.aan4399. Posted in Climate change, Geology and tagged carbon dioxide, Climate change, global warming, Nitrogen on April 24, 2018 by wryheat2.